Started reading this series today!! These colors remind me of the color scheme in the anime's opening. I also like how Mob seems desperate for help by reaching his hand out. Even though this is from another anime, it looks like a younger version of levi ackerman! 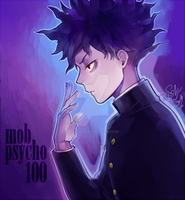 Mob doesn't look like Levi to me. If Levi were to resemble an anime character from another series, it'd be Hunter x Hunter's Feitan. XD Sooo true I just searched him. The face.. he looks like Levi! I love Mob Psycho so much////. I'm dying to see more of the anime too, lel;;;. And I always love the contrasting colors that you use///.